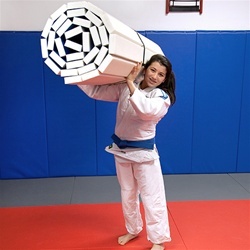 This lightweight and portable roll-out mat lets you train whenever and wherever you want – at home, on the road, outside, anywhere – so you can keep honing your skills even when you’re not in the gym. Because it’s a Zebra Mat, you‘ve got the support of the industry’s highest quality mat maker behind you with every move you make. Practice makes perfect, and Zebra’s portable roll-out mat is the perfect partner to take you where you want to go. Zebra recommends this mat for home use ONLY. 1.38in x 10′ x 10′. Combine 2 for a perfect 20’ x 20’ training area.Just roll it out and get it on. It’s easy roll set-up & store, it’s lightweight and portable! Available in black and blue.